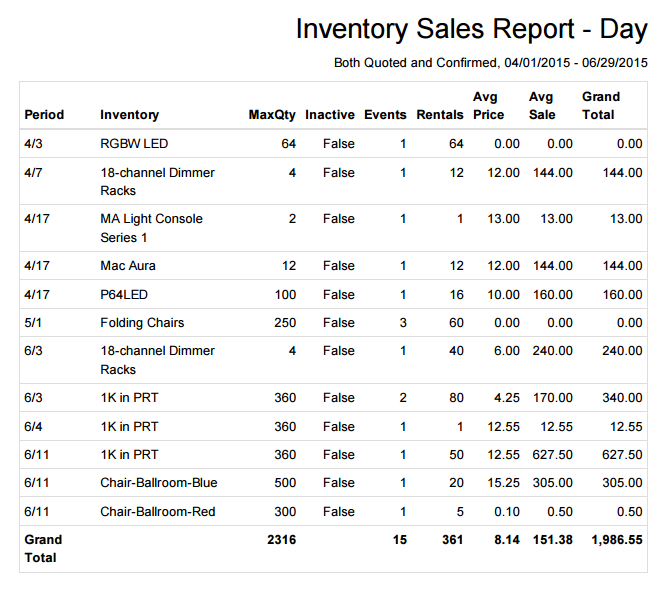 We're excited to announce our latest addition to EquipCalendar, a new report called the Inventory Sales report. It was suggested by one of our users, an event solutions company, and is a great new tool for any customer who loves analyzing sales data. 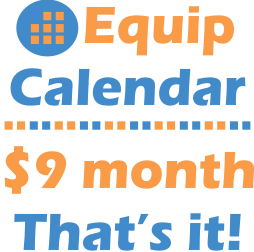 Enter a start date, end date, specify the group by (Day, Week, Month or Year) and status (Quoted, Confirmed or Both). The report can preview the data or export it to CSV (Comma Separated Values). MaxQty: The maximum available quantity of the inventory item/product. Events: Number of events the inventory item/product is scheduled for in that period. Rentals: Number of units rented in that period. Avg Price: Average price of each unit rented in that period. Avg Sale: The average total sale amount for all events in that period. Grand Total: The total sales for all events in that period. No matter whether you use a PC, tablet or smartphone, our reports will provide a nice printable format for use on that device. The above CSV export is for the Day grouping (group by). It also has columns for Year, Month, Day and Day of Week for further analysis. What you see above is what you'll get when you export this report to CSV (Comma Separated Values).